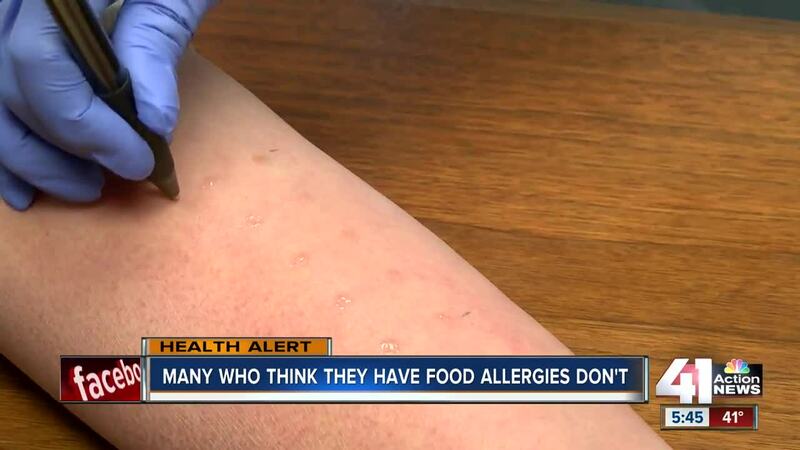 About half of adults who think they have a food allergy, actually don’t. A study released in January showed many adults think they have allergies, but haven't been tested. According to the survey results from the study, at least 10.8 percent of U.S. adults are food allergic, but nearly 19 percent believe that they have a food allergy. The report states, "these findings suggest that it is crucial that adults with suspected food allergy receive appropriate confirmatory testing and counseling to ensure food is not unnecessarily avoided and quality of life is not unduly impaired." In addition, the report published in The Journal of the American Medical Association concluded that half of American adults with confirmed allergies developed them in adulthood. Doctors in Kansas City, Missouri, said if you have a reaction after eating a food, it’s important to visit your primary care physician and perhaps a specialist to receive testing. “Eighty-five percent of what I'm going to learn about a patient comes from sitting and talking about what were their allergies when they were little: did they have colic? Did they have trouble with food as a baby? And then on up to even as an adult,” said Dr. Bruce Pfuetze, an allergist at College Park Family Care Center in Overland Park, Kansas. The top food allergies in adults are shellfish, milk and peanuts. Doctors at Pfuetze’s office and elsewhere in the Kansas City area are helping patients desensitize their allergy. “Say they get a bite of cookie that had peanut in it, or they may be exposed to peanut butter in one way or another. Now, they're much less likely to have a reaction. They still need to have the injectable epinephrine available,” Pfuetze said. While someone may not have a food allergy, they may be intolerant to a food, which can be just as uncomfortable. In its basic sense, an intolerance affects your digestive system, resulting in bloating or diarrhea. An allergy affects your immune system, resulting in swelling, hives, an itchy mouth and throat.